The Defiant 10-Outlet Surge Protector is ideal for powering tools and electrical devices in your workshop or garage. This surge protector resists impact damage with its metal construction. It offers a heavy-duty 15 ft. cord to accommodate devices with short cords. Surge protector with 7 sliding cover outlets with two 2.4Amp USB ports.This surge protector is equipped with 1 adapter spaced outlet to fit large plugs, 1530 joules of surge protection, grounded and protected LED lights to ensure protection, Coaxial cable connectors for added protection to cable and satellite lines, EMI/RFI power filtration, Low-profile, right-angle plug fits in tight spaces, and a 6' power cord. 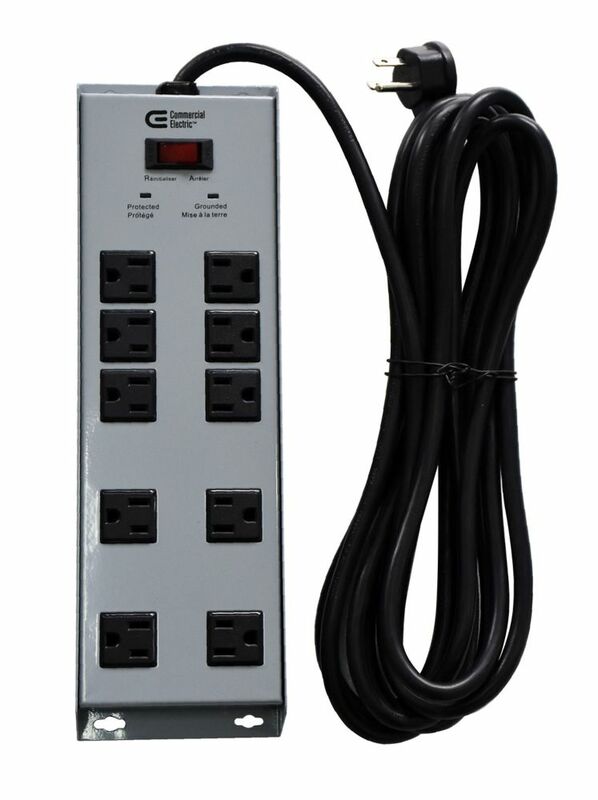 Surge protector with 12 sliding cover outlets, 4 adapter spaced outlet to fit large plugs, 3.4Amp/17 Watt output, 3890 joules of surge protection, grounded and protected LED lights to ensure protection, Coaxial cable connectors for added protection to cable and satellite lines, Combo ethernet/fax ports as added protection for for phone and data lines, EMI/RFI power filtration, Low-profile, right-angle plug fits in tight spaces, and a 8' power cord puts power where you need it. Surge protector wall tap with 4 rotating outlets to fit large plugs and dual port 3.4 Amp/17 Watt USB Charging. Includes a mounting screw for secure attachment. 918 Joules of surge protection. Hand painted silver back housing reflects existing wall colour to match any environment. The new SideLine2.4 Revolve Edition surge protector smartly positions three outlets on each side to fit power neatly behind your couch, TV or other domestic wall-huggers. SideLine2.4's two Revolve outlets rotate 3600 to fit bulky plugs while dual USB ports with 2.4A output keep a phone and tablet juiced at full speed. On top of all that utility, Sideline2.4 has enough cool factor to emerge from behind your furniture to power up devices all over the house. 15 ft. 10-Outlet Metal Surge Protector Cord The Defiant 10-Outlet Surge Protector is ideal for powering tools and electrical devices in your workshop or garage. This surge protector resists impact damage with its metal construction. It offers a heavy-duty 15 ft. cord to accommodate devices with short cords. 15 ft. 10-Outlet Metal Surge Protector Cord is rated 4.4 out of 5 by 49. Rated 5 out of 5 by Jim4114u from Nice surge protector. Bought it to replace a daisy chain... Nice surge protector. Bought it to replace a daisy chain of power strips. More than enough outlets for the job and the spacing allows all outlets to be used no matter the size. Rated 5 out of 5 by HomeDepotCustomer from It's just what I needed for my patio!... It's just what I needed for my patio! Hi Elsie, The item has ETL safety listing.